Folks in Key Largo are obsessed with fishing! Why? Simply because the fishing is so good. There are more than 450 species of fish in the waters off Key Largo. 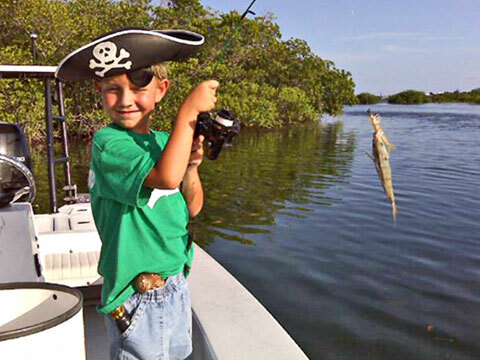 Consequently, Key Largo is home to many fishing tournaments, for tarpon, sailfish, dolphin as well as bonefish. Most tournament fishing is for what is called catch and release. Today, many anglers op for a quick photo confirmation of their catch and then may choose to purchase a replica fiberglass trophy for their wall back home. Most fishing for tarpon (aka The Silver King) occurs in the spring and right up through July. Back country fishing happens on the 'bay-side". It is usually for bottom fish like grouper and snapper. Both grouper and snapper come in many varieties and most caught end up on the dining table that evening. You can even catch shark and barracuda in the back-country. Flats fishing is done mostly for bonefish and permit and is thought by some to be the more "sophisticated" form of fishing. This type of fishing was made popular by such legends like Zane Grey. Bonefish are smart, and it takes a cunning angler to hook let alone land one. Most fishing is done with flys so casting skills are a must. Once hooked, bonefish take off like a rocket, leaping and running while attempting to shake the hook. Although you can go bonefishing all year round, the most popular times are May, September and November. Be sure to check out our Fishing Videos on KeysTV.com for some arm chair excitement!